After the hog was taken care of Richard and I was going to another water hole. On the way I saw out of the corner of my eye a coyote out Richard's window. So I stop where some brush was between us and the coyote. Told Richard to get his rifle ready that there was a coyote about ten yards right of a telephone pole. I then backed up to where there was a shooting alley. Richard was trying to find him in his scope. The coyote moved and so did we. I backed up a little more. He was still trying to find his target. He was having to shoot left handed. A good thing to practice is using your off hand. 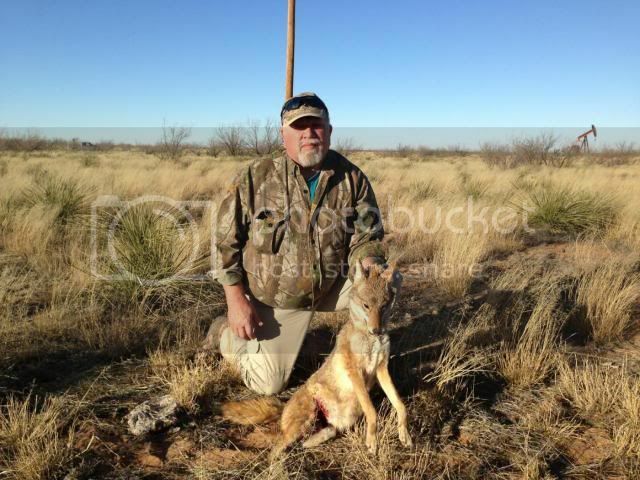 He acquired his target and as he squeezed the shot off the coyote moved. The 243 Win found it's mark a little left of it's intended spot. 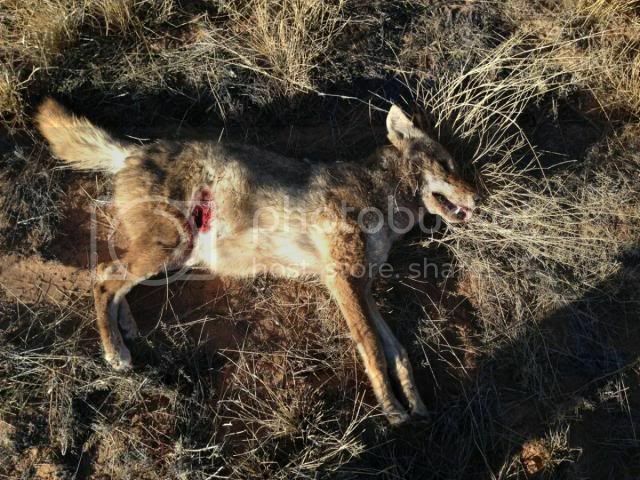 But the coyote was down and that's what counts. She was a 142 yards from the truck. A good day spent with a good friend. Your mate done good Clint. A gut shot isn't always ideal, but sometimes, as in this instance, we don't have any control over the hit. I agree with practicing using your weak side for shooting mate. Just recently I was forced to change from right handed shooting to left handed because of a dodgy eye...it has taken me nearly 12 months to create muscle memory on my left and get used to shooting from the "wrong side"...or as my shooting buddy says, the "dark side" (yep, he is a lefty). you got the critter and used enough gun to give you enough margin of error to do so. as V said "not ideal" but you got it. I have been shooting with both right and left hands for years now with rifles and pistols.